This My Little Pony Friendship is Magic Dr. Whooves Pop! 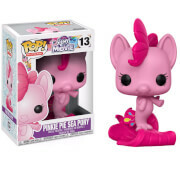 Vinyl Figure features the Earth pony as a 3 3/4-inch tall vinyl figure, rendered in the Pop! Vinyl form from Funko. Time Turner / Dr. Whooves looks great and would be an amazing addition to any My Little Pony: Friendship is Magic fan's collection!